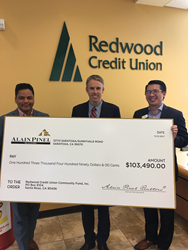 On Nov. 21, Alain Pinel Realtors (APR) presented a check totaling $103,490 to the Redwood Credit Union Community Fund in an effort to help those affected by the devastating North Bay fires. Launched on Oct. 13, APR’s North Bay Fire Relief Fund collected more than $50K in donations in less than two weeks, an amount that was matched dollar-for-dollar by the brokerage. For more information or to make a donation to the Redwood Credit Union Community Fund, please visit https://www.redwoodcu.org/northbayfirerelief. Alain Pinel Realtors (APR) is the largest privately owned residential real estate company in Northern California and is consistently ranked among the top 10 largest residential real estate firms in the United States based on closed-sales volume. The firm has 1,400 agents in more than 30 offices throughout Northern California. APR was founded in 1990 by Chairman and CEO Paul L. Hulme, and is based in Saratoga, Calif. Visit us at apr.com, china.apr.com, facebook.com/AlainPinelRealtors, and @AlainPinel.